"I talked to him on phone today and explained that constituting a committee means law will be formed. Perhaps Ramdevji had some misapprehension because we said that we would make a committee." New Delhi, June 5 (ANI): Union Human Resource and Development (HRD) Minister Kapil Sibal justifying the government''s stand after the yoga guru was evicted from Delhi''s Ramlila ground in a past midnight drama, on Sunday said Baba Ramdev politicized the whole issue. "He had promised only for yoga and the crowd would not exceed 5,000. But around 50,000 persons were present. We had accepted all his demands in written. But Ramdev did not keep up his promise and politicized the issue. 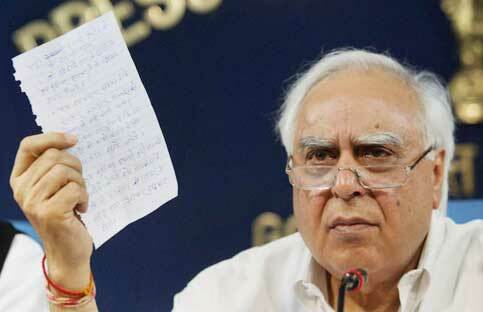 He cheated all his supporters," Sibal told reporters here. "Baba turned his yoga session into a political stage. Now, it''s clear that Ramdev is the another face of RSS," he added. Congress General Secretary Digvijay Singh earlier today justified the action, saying the treatment meted out to Ramdev was appropriate. "There are certain laws and regulations in the country, you cannot allow people like Ramdev to run riot in the capital city. He was trying to incite people in the Ramlila maidan," he said. Singh said Ramdev had reached an agreement, but still went ahead with his fast. "This is another way of fooling people. He deceived the entire country," he added. Further alleging that the yoga guru had indulged in ''illegal activities'', Singh said that there should be a full probe into Ramdev''s activities. The talks between the Central Government and Ramdev crashed last night with both sides citing betrayal. Yoga guru, Baba Ramdev said he would never again hold talks with Kapil Sibal. Ramdev, who is fasting at Ramlila Maidan in Delhi, had earlier announced, amidst cheers from supporters, "Government has agreed to all our demands... The agreement has been on phone as of now and when it is provided to me in writing, I will call off the fast." Sibal in the press conference also said that keeping Ramdev's demands in mind, the government was ready to draft a law to declare ill-gotten money stashed away in foreign countries a national asset and to award severe punishment to the offenders. He also said that a committee would be appointed for drafting the law in six months. "The readiness to form a committee means the government is committed to drating the law," Sibal said. When going to press the government on Saturday night sent a written assurance to Baba Ramdev on enacting law on black money and declaring it as national asset. However, after what Sibal said in the press conference, Ramdev said he would continue his fast until an ordinance embodying his demands was issued. The cabinet ministers, who were making all attempts to persuade Ramdev to give up his fast said that he had promised he would end his fast last evening. A letter was produced in this regard. Ramdev, however, said the government was lying, and added that the letter had been conditional upon the government agreeing to his list of demands.